Team Noble Drilling is a dedicated group of riders and volunteers working together to raise money for the National Multiple Sclerosis Society. 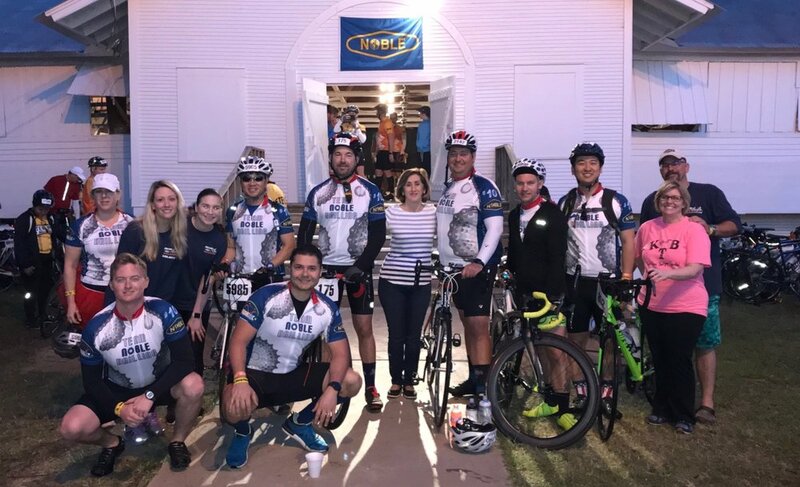 Team Noble Drilling is a group of more than 100 riders and volunteers participating in the BP MS 150 to benefit those living with multiple sclerosis (MS). Since its founding in 2013, Team Noble Drilling has raised over $2,300,000 in donations to the National Multiple Sclerosis Society, making it one of the largest annual contributors towards this cause. We hope that you will join us in support of reaching our 2019 goal of $800,000 raised, and the vision of making a world free of MS. Most people with MS are diagnosed between the ages of 20 and 50, with at least two to three times more women than men being diagnosed with the disease. The BP MS 150 is a two-day fundraising bike ride organized by the National Multiple Sclerosis Society. The 2019 ride will be held April 27-28. The ride is the largest event of its kind in North America, with 13,000 cyclists, 3,500 volunteers, and countless spectators along the route and at the finish line in Austin. The fundraising goal for the 2019 BP MS 150 is $14,000,000. Your participation will drive MS research forward faster and deliver services to those who face the challenges of MS every day so they can live their best lives. We ride for Jennifer McDaniel and Ron Swan. We ride for fun. We ride for comradery. We ride because others cannot. Each member of Team Noble Drilling has their own reason for riding. What brings us together is our common bond in wanting to be a part of something bigger. It is that bond that drives our team each year, for each mile ridden, for each dollar raised. We see the difference made in the lives of those who have multiple sclerosis and it motivates us to continue onward.